According to a recent study by researchers at the University of California, San Francisco, published by the American Journal of Public Health, regularly drinking high levels of sugar-sweetened soda could lead to the premature aging of immune cells, leaving the body vulnerable to chronic diseases in a manner similar to the effects of smoking. The study showed that persons who drank large amounts of sugary sodas have less protective DNA in their white blood cells. As cells age they have less of the protective DNA at the ends of their chromosomes or telomeres. This DNA acts as a cap to keep the chromosomes from clumping. As cells age over time, the telomeres get shorter. Consumption of fruit juices had only a slight effect on telomeres, in this case leading to slightly longer lengths. Non-carbonated sugar-sweetened beverages and diet-sodas were not seen to have significant impact on telomere length. White blood cells (leukocytes) are an important part of the immune system. As they age their telomeres also get shorter. The length of white blood cell telomeres has been linked to the length of our lives. The shorter the telomeres, the greater the risk that the cells will not operate properly. In the case of white blood cells, premature aging weakens our immune system and leaves us vulnerable to a wide variety of acute and chronic conditions. The shortened telomeres are associated with tissue damage, inflammation insulin resistance, and chronic diseases associated with age, including diabetes and coronary artery disease. 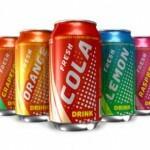 The article concludes that the development of metabolic diseases might be influenced through accelerated cell aging as a result of regular consumption of sugary sodas.